Political cartoons can be subversive, pointing out weaknesses in government organizations and leadership. Iran is a country with an especially deep cultural history of political cartooning. It’s so integral there that the municipality of Tehran even sponsors the House of Cartoon, which hosts exhibits and education in cartooning, hoping for cross-cultural events which mix Iranian cartoonists’ work with that of foreign artists. It also recently held a competition for anti-ISIS cartoons: the Daesh (an acronym of the full Arabic name of ISIS, also considered slightly derogatory toward the group) International Cartoon and Caricature Contest. The winners were predominantly Iranian, a testament to the talent still working in the country. The irony in this statement is, of course, that while the Iranian government in some ways supports this heritage, it in more than equal measure disrespects the purpose of political cartooning as a medium. The contemporary type of political cartooning in Iran has roots in the last days of the Tsarist regime in the 1900s, where censorship laws prevented regular publication of satirical magazines until around 1906. Magazines such as Molla Nasraddin took radical stances, criticizing clerics and Western politics alike. But while the legacy of this history lives on, so does the shadow of government censorship. The current Iranian government has a history of imprisoning journalists like Memarian for being perceived as critical or seditious, and anti-government cartoonists face the same threat, despite this long history of politically charged cartoons. The Iranian government clearly understands the visceral impact of a well-crafted cartoon, leading to the dichotomy where they desire to harness that power against their enemies while stifling it when it is turned against them. during the 2009 uprisings and elections. Amnesty International describes the cartoon in question as being “critical of members of the parliament for considering a bill that sought to criminalize voluntary sterilization as part of a larger plan to restrict access to contraception and family planning services.” Farghadani was initially arrested in August 2014, and held for five months. Upon her release, she created a video that detailed her mistreatment while in custody. She was then arrested again in January 2015, for the same cartoon. Farghadani has been sentenced to 12 years and 9 months in prison for the offenses of on charges of “gathering and colluding against national security,” “spreading propaganda against the system,” “insulting members of parliament through paintings,” “insulting the Supreme Leader of Iran,” and insulting her interrogators, according to Amnesty International. She began a hunger strike in February 2015 to protest the conditions in Gharchak Prison, where she is being held, and at one point suffered a heart attack. She is still incarcerated there. Recently, a #Draw4Atena hashtag campaign has started on Twitter, where cartoonists are drawing comics to draw awareness and show solidarity with her plight. This dichotomy shows the power of visual activism — one that is both sought and feared by those in power in Iran. As the comics community continues discussions on free speech in the wake of the Charlie Hebdo tragedy, it is important to remember that artistic freedoms to deliberately offend are not the only freedoms that can put cartoonists at risk worldwide. In May 2015, the Committee to Protect Journalists released a report highlighting the threats to political cartoonists all over the world, with a focus on a Malaysian cartoonist Zunar, who is facing nine charges of sedition which could result in up to 43 years of imprisonment. As these stories illustrate, the threat faced by political cartoonists is real. But sometimes it feels as though the real threats faced by some creators go unappreciated, as the cartoonist community seeks to define censorship in relation to free speech. Not all cartoonists run the risk of losing their lives, and it’s hyperbole to pretend that all genres carry the same risk as publishing politically charged cartoons under a government that uses prison time to censor. 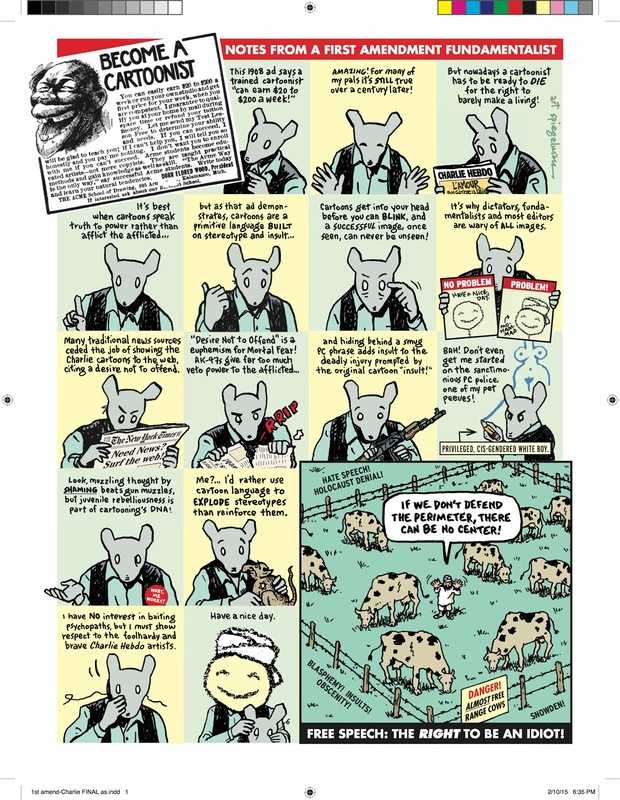 It irks to see critically lauded and respected cartoonists like Art Spiegelman seemingly conflate “gun muzzles” and “muzzling thought by shaming“ as being equal threats to free speech. And some critics and artists claim that the a “vocal minority of fans” are causing comics to be censored. The truth is, no one is preventing these mainstream Western writers and artists, like Spiegelman and Milo Manara, from creating art that some find objectionable. The current trend for some of lamenting “political correctness” for destroying art and free speech feels insulting; it does a disservice to artists who face real government censorship, threats to their freedom and lives, and actual gun muzzles. For a first-person account of a cartoonist’s imprisonment in Iran, pick up Mana Neyestani’s An Iranian Metamorphosis, recently published in English by Uncivilized Books.